A while ago I read Otto Penzler’s The Great Detectives: The World’s Most Celebrated Sleuths Unmasked by Their Authors. It was a wonderful book, with essays from various authors describing the birth of their detectives. And one of the most fascinating essays of the bunch came from a man named Leonard Holton. I’d never heard of him before, but apparently in the 70s, he was known as the creator of Father Joseph Bredder, a detective well-known enough to be included in The Great Detectives. Immediately I went to the Kindle store. After all, nearly every other author included in The Great Detectives is Kindle-available. But I was met with a blank: as far as Amazon was concerned, Leonard Holton had never existed, and Father Bredder also turned up a blank. So I went on a mission to find something written by Leonard Holton. The mission ended surprisingly early: my ever-reliable local used bookstore, Paperbacks Unlimited, had two Holton novels on the racks inside the store. A few dollars later, I walked out of the store eagerly clutching The Saint Maker and Deliver us from Wolves. But there was a problem. As wonderful as Holton’s essay was, he had spoiled the solution of his book The Saint Maker. So I set these books aside for the moment, hoping that once I got back to them I would have forgotten whodunit and why. Unfortunately, that was not the case, and so finally I decided to read The Saint Maker and hope for the best. And I got it. The Saint Maker tells the story of Father Bredder. One day, when he returns to his church after visiting his sister, he finds a human head in a canvas bag. Someone apparently took his canvas bag, which had a melon inside, and replaced it with the gruesome severed head. The head belong to a young woman, and Father Bredder seems to find some sort of vague familiarity in her face. But nobody can definitively identify her, and the case quickly goes cold. When rumours spread that Father Bredder was responsible for the murder, he decides to take matters into his own hands and discover the culprit: not only to clear his own name, but also to lead the murderer to repent and cleanse their soul of this vile act. Father Bredder is a fascinating character: an ex-Marine who one day became sick of all the violence he was forced to direct at fellow men. So he left the Marines and came to the Roman Catholic Church, becoming a priest. 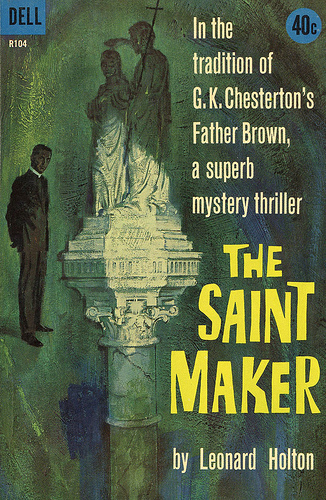 Although the cover advertises the book as being “in the tradition of G. K. Chesterton’s Father Brown”, Father Bredder is a very different character. He has a fear of sounding pompous and patronizing and is embarrassed when he misunderstands the purpose behind a question and delivers a mini-lecture to the police officer in charge instead. Father Bredder is not nearly as confident as Father Brown, and he has trouble getting along with the convent’s Reverend Mother. In short, this is a very human depiction of a priest, and one of the most fascinating religious detectives I have ever encountered. The story is also very well-told, and the ending was a very compelling one, with Father Bredder drawing some fascinating conclusions about faith with which I personally agree. However, if you are expecting a detective story in the classic mould, with fair play and a level playing field, this is not that book. This is a fine crime novel, but the ending really comes a bit out of left field and some other plot twists throughout equally come out of the blue. While Father Bredder does some important detective work, one vital piece of information never comes up until the ending, and this information gives you something that was missing until then: motive.